The e-pill Accutab pill dispenser makes it easy to dispense one patient's medications, vitamins or supplements up to three (3) times per day for one week. Easy to Use even for Patients with Severe Arthritis: The concept for the e-pill Accutab dispenser was developed by an arthritis patient. Accutab has an added bonus for patients with arthritis whose condition makes it painful to open medicine bottles every day. The Accutab does not require AC power or batteries. Mounting bracket and screws are included. The e-pill Accutab automatic pill dispenser takes the work out of organizing and identifying all your medications. This pill organizer and dispenser installs under or inside your kitchen cabinet or medicine cabinet. How-It-Works: The weekly pillbox is loaded once a week by caregiver or patient. 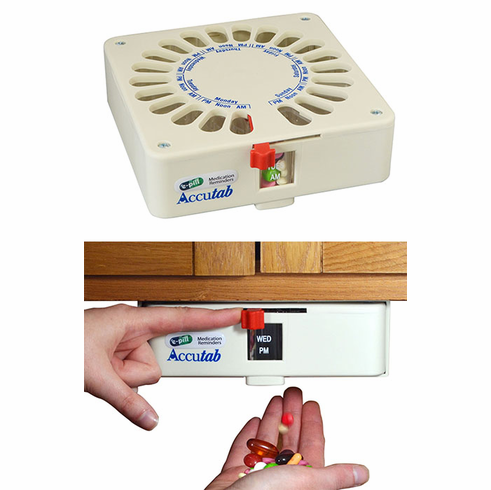 When it is time to take medications, just move the lever on the front of Accutab pill dispenser from left to right to dispense the pills. Hold your hand out or a cup to catch the pills that fall. Refill once-a-week on Sunday night or use Two (2 Accutab (one pre-filled) and do a change-over on Sunday. This device is MUCH BETTER than pill boxes or trays. The patient does not have to open any little lids. The slots are large. The lever is easy to push. It is fun for the patient to hold a little cup under the device and push the lever. The caregiver/family member can easily see if the patient has taken the dose out of the device on time. IT IS GREAT!! !- A. R.
Accutab is NOT child proof. Mounting Information:Mounting bracket 8 inch x 6 1/2 inch (needs 8 inch total depth for mounting) x 3 1/4 inch. Mounting bracket, Mounting Tape, and Screws (4) are included.